YEAHHHH, I got my order in today, I ordered an equador and B+ but RH was out of B+ and sent me a gulf coast instead. Anybody famiiar with this strand? Any general advice? Whats the best for it to grow on? Any suggestions would be appreciated. There impossible to get to pin/fruit. good luck. You'll need it. Afoaf ended up tossing a bunch of casings. maybe thats why afoaf is having such a hard time with his/her GCs, especially since it's their first time! hey ralph, can afoaf get a different strain! 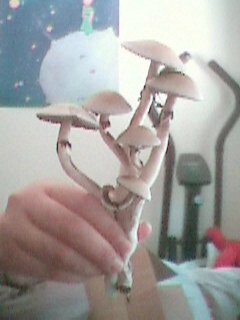 i cant see why the gulf coast would be so hard to pin or fruit..its cubensis isnt it? one of the most forgiving mushrooms species out there..all it takes is patience..
Ralph whats the deal with the GC's is there anything to this? The reason Im asking is I just innoc'd a batch of jars a few days ago and if this is true I might as well start another batch asap. nah- nothing to this. 3m's gc's anyways pinned like mad, are awesome colonizers, and gives heavy yields (if not shorter fruit). just as easy as any otehr cube. bouquet of gulf coasts, from a 2d flush. heres another thread with a few pics of the gc's: here. id say they are very easy, fast, etc- everything i said in this post so i wont say it again. ::grin:: but like blue said- theres different kinds of gc's, HQ and her jackal got these (and the resulting pics) from 3m, who says on his site theyre from alabama. 1,210 topic views. 20 members, 73 guests and 17 web crawlers are browsing this forum.